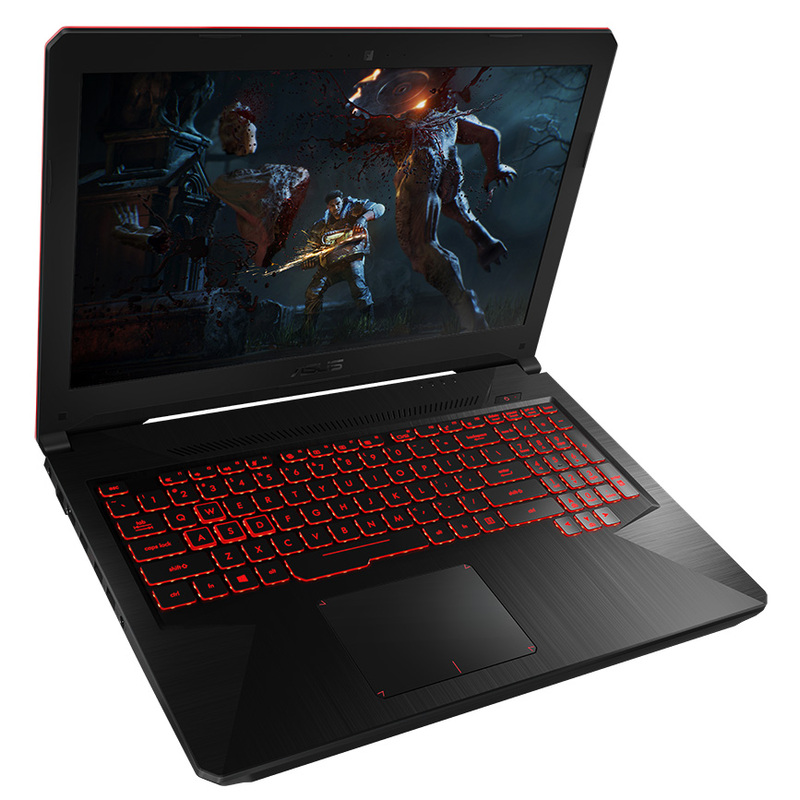 The inexpensive FX504 gaming notebook comes equipped with a Coffee Lake-H CPU and GTX 1050 GPU for a starting price of only $700 USD. The system is intended to complement the recently revealed mainstream Zephyrus GM501 and enthusiast ROG G703 that are also shipping with Intel 8th gen Core ix CPUs. Outside of Asus' vaunted Republic of Gamers series is the more affordable gaming lineup catered to mainstream gamers on a budget. Part of this lineup is the Asus FX series that borrows sparingly from its pricier siblings with its cheaper plastic materials, slower specifications, and more limited features to reach that attractive price point. The latest model in the FX series is the TUF FX504 to succeed last year's FX503. It's largely the same design as the FX503 save for some new red trims and accent marks on the outer lid that appear to be purely for aesthetic reasons. Internally, however, users are treated to new 8th gen Core i5-8300H and i7-8750H CPUs and 1.7 Gbps WLAN options for faster multi-threaded performance and WiFi speeds, respectively. The 120 Hz 1080p panel also makes a return but with a wider color gamut than before (94 percent NTSC vs. 72 percent NTSC). Another noteworthy difference between the FX503 and FX504 is that the the latter is slightly thicker (25 mm vs. 24 mm) than the former despite being identical in length and width. We can only hope that the extra millimeter means improved cooling, better keyboard keys, or increased rigidity over the previous incarnation. The base TUF FX504 SKU with the i5-8300H and GTX 1050 is now available for pre-order on Amazon with an expected ship date of late April or early May. The Asus U.S. site is not displaying the core specifications for the model correctly at the time of writing, but the Asus Malaysian product page is loading normally for those who want to check out the specs. TAIPEI, Taiwan, April 03, 2018 —ASUS today announced TUF Gaming FX504, a powerful Windows 10 gaming laptop that combines immersive gameplay with extreme durability. 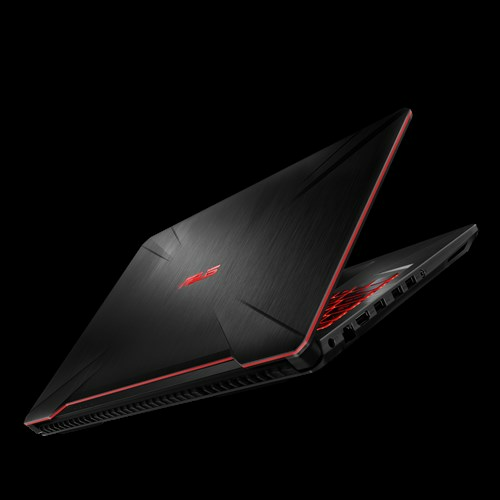 FX504 is the first laptop in the new TUF Gaming Series. 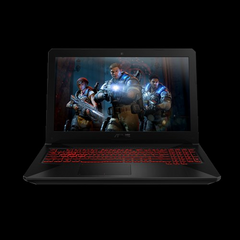 This series embraces the core essence of the legendary The Ultimate Force (TUF) Series, resulting in affordable gaming laptops that prioritize stability and durability above all else. To ensure system longevity and stable performance, FX504 features the patented Anti-Dust Cooling (ADC), and it's powered by the latest-generation Intel® Core™ processor and NVIDIA® GeForce® GTX 10-Series graphics. FX504 also features a gaming keyboard with a 20-million-key-press lifespan, a 15.6-inch 120Hz display, and 7.1-channel surround sound. 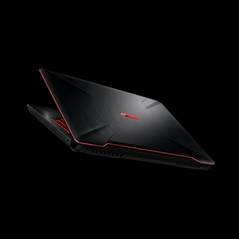 FX504 is powered by the 8th Generation Intel Core i7-8750HQ processor, and features up to NVIDIA GeForce GTX 1050 Ti graphics with full Microsoft® DirectX® 12 support. With a slim 2.5cm chassis and an overall weight of just 2.3kg, FX504 offers a combination of performance and portability that’s great for on-the-go multitasking, entertainment, and gaming. FX504 has a 15.6-inch display with an ultrafast 120Hz refresh rate, a 3ms gray-to-gray (GTG) response time, a 130% sRGB color gamut, and wide-view technology. At 120Hz, the display is capable of showing up to 120 frames per second (fps), so movies appear more vivid and games run smoother to let gamers react instantly to the onscreen action, giving them an advantage in fast-paced titles. The display has a 130% sRGB (equivalent to 94% NTSC) wide color gamut and wide-view technology to ensure sharp and clear images with accurate and consistent color, even when viewed from extreme positions. The panel also has a matte finish to virtually eliminate distracting glare or reflections. The thermal design of FX504 significantly prolongs its lifespan and provides stable cooling during intense gaming marathons. HyperCool technology pairs the patented ADC system with Fan Overboost. The ADC system expels harmful dust particles and dirt through two dedicated tunnels to prevent build-up in the thermal fins. The Fan Overboost function provides users with three different modes for the perfect balance between fan performance and noise level. Additional cooling features include a pair of copper heat pipes and a dual-fan system to cool the processor and graphics card independently, while the trapezoid-cut lid optimizes airflow to increase thermal efficiency by up to 27% compared to a standard laptop chassis. An intelligently-placed fan is located right below the WASD key group to ensure the keyboard stays cool even during long gaming sessions. Designed and built to exacting TUF Gaming standards, FX504 has a desktop-style gaming keyboard that's perfectly optimized for extended gaming and typing sessions. It's one of the most durable keyboards to be found in a laptop, with a lifespan of 20 million key presses — double the current industry standard. The scissor-switched keys have 0.25mm keycap curves and offer 1.8mm of travel for smooth and tactile keystrokes, and are backlit for gaming or working in the dark. Exclusive Overstroke technology enables earlier actuation and a longer over-stroke distance for fast, accurate, and effortless keystrokes. Highlighted WASD keys, a broad space bar, and isolated arrow keys enable fast and accurate control. For high-performance wireless connectivity, FX504 incorporates the latest Intel 802.11ac Wave 2 Wi-Fi for data transfer rates of up to 1.7Gbps — 12X-faster than baseline 802.11b/g/n. Additionally, the 2x2 MIMO configuration provides up to 30% wider coverage than a 1x1 configuration. Users can stream high-res videos or play online with fewer dropped connections, even if FX504 is far away from the router. Performance with durability is demanded for all TUF products, so FX504 features a 1TB 5400rpm FireCuda™ solid-state hybrid disk (SSHD) that loads games more than twice as fast as the more commonly used 1TB 5400rpm traditional HDD. FireCuda’s flash memory acts like a cache by saving frequently accessed data without accessing the hard drive, resulting in lower power consumption, increased system performance and durability. It also provides a quieter, more stable system.